It's Works-For-Me-Wednesday over at We Are THAT Family! It's a great place to get all sorts of great tips, ideas, recipes, and more - you should definitely check it out! One thing that has been working for me lately is free online photography classes. I'm currently taking a free Digital Photography class with Creativetechs.com and I'm very impressed with it! They are currently offering other online classes and have plans for more as the current classes end. All of the classes are free if you are able to watch the live class online. If you can't manage that, you can purchase downloads of entire classes to watch at your convenience. The fees for downloads are less than you would pay to attend a college or adult school class. These classes are taught by experts and are extremely informative. I find that it's even helpful to take notes. The Digital Photography class I'm taking is mainly lecture with Power Point slides, but also has interactive polls and answering of audience questions. I think these classes are nice for adults who are interested in these subjects, but would also be great for homeschoolers. Here are some of the classes that are in progress: Lightroom, Dreamweaver, Digital Photography, Photoshop, and Retouch Live. There are new classes being planned as these finish up. Once you enroll, they send you e-mail reminders for the classes. I really encourage you to go take a look at Creativetechs.com! You can't beat free! 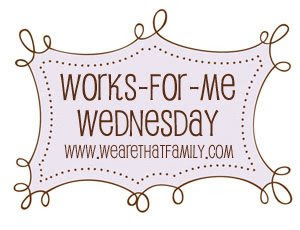 Don't forget to stop by We Are THAT Family to see what's working for everybody on Works-For-Me- Wednesday! Big Free Digital Mega Pixel size hugs to you! I'm going to bookmark that and think about letting my 15yo DD try it since she's into digital photography already. Thanks for sharing! That's awesome! Thanks for sharing! Since our move, I have been considering taking photography classes at a local tech school, but WHO HAS THE TIME?? This could definitely work for me!! Nice change to your blog. Glad I had a chance to stop by. Thanks for the tip! I DESPERATELY need a photography class! Free works for me!! What a great idea! I will definitely have to check it out! I would love a photography class. Maybe I could finally figure out how to use my fancy camera and get some pictures on my blog...maybe!